The major obstacle for Canadian amateur athletes to achieving success at the international level is funding for equipment, training, travel and competition. 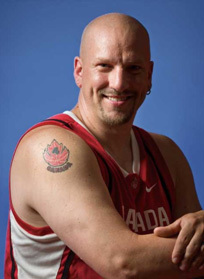 As the only member on the Men’s Wheelchair Basketball team from Atlantic Canada, travel is essential for training and competitions… my thanks goes to CAN Fund for their financial support in helping me keep my dreams alive for our quest for GOLD at the 2012 Paralympics. I enjoy Motorcycling, mudding with my off road jeep, and snowmobiling. In fact… I drove my snowmobile around the Province of New Brunswick 2yrs ago and I plan on doing it again this winter… my superstition is the number 4 on my jersey. I have been wearing number 4 ever since I made my first basketball team at the age of 12yrs old.